In procurement, category management means organizing purchases into units that match distinct categories of suppliers (rather than according to internal needs and processes), and then aligning management of those categories to the organization’s key objectives. With category management, organizations can pursue distinct strategies that match the realities of each category, rather than simply trying to negotiate lower prices. For example, maintenance, repair and operations (MRO) materials as a category may be most effectively managed by bringing more spend under management across locations and normalizing part-numbering systems to identify consolidation opportunities. For the IT category, the greatest benefit might be obtained by examining licensing terms, improving the ability to tie costs to business functions and creating a more efficient RFP process for new deployments. By applying differentiated approaches to each category, the purchasing organization can achieve greater value. By providing the ability to consolidate purchases appropriately, deeply analyze spend and match procurement strategies to market realities, effective category management can drive down purchasing costs significantly. In a survey by Future Purchasing, those identified as category management leaders saved 11% or more on total spend. However, less than a third of organizations in the survey described themselves as having optimized capabilities as of 2017. With the increasing digitization of the procurement lifecycle, companies can address some of the most prevalent barriers to success. First, there’s the availability of data necessary to categorize purchases. Most large companies have centralized procurement operations, but they often incorporate a specific subset of purchases such as those from contracted suppliers. They often lack a comprehensive view, especially for categories considered “non-strategic” such as office supplies and MRO. Many organizations use Amazon Business to consolidate off-contract spend, which makes a higher proportion of purchases available for categorization. The easy-to-use, yet powerful reporting tools can help category managers analyze what’s being bought and by whom. The second challenge is getting the required buy-in from the various stakeholders. Category management is a cross-functional discipline that requires input from business decision makers, not just procurement professionals. Digital procurement tools reduce the amount of time and effort required to participate in the category management discussion. With the right data, stakeholders can make faster decisions, identify redundancies, monitor trends and measure the results of their efforts for continuous improvement. In addition to how organizations track and analyze their own spending, category management relies on an understanding of how suppliers behave. By bringing many suppliers together in one place, Amazon Business enables organizations to see development within categories in real time. They can find innovative new offerings, track prices over time and identify potential partnerships within product categories. There’s also a larger opportunity for organizations to redefine how they engage with suppliers. Traditional category management revolves around bringing more purchases under the heading of “planned spend,” with catalog-based pricing built on long-term, high-volume contracts. Amazon Business opens the possibility of a different approach—one that leverages the open marketplace model of Amazon rather than the planned spend model, driving down prices for a wide range of items. This also lets teams focus on more strategic efforts such as changing internal processes and behaviors, managing supplier relationships and forecasting trends. Find the data and tools you need for effective category management across a wide range of products. 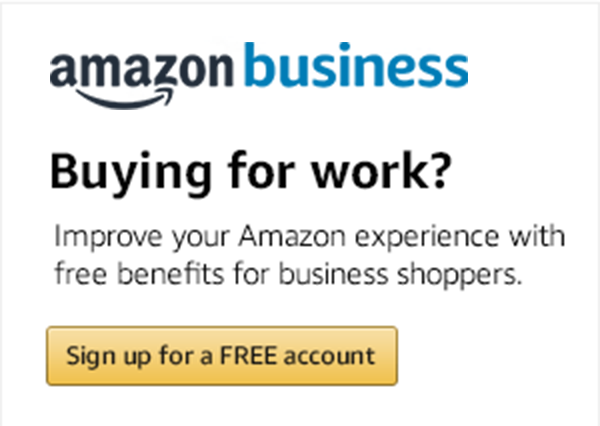 Create a free account at www.amazon.com/business.